Todd Graham and the rest of the ASU staff hosted a number of verbal commitments and recruiting targets over the weekend. We may be well into the college football offseason, but the lights were on at Sun Devil Stadium on Saturday night. It may have had to do with the north end zone renovation project, though that seems unlikely on a weekend night. It seems more plausible that the lights shined brightly on Frank Kush Field for a group of special guests. Arizona State kicked off the home stretch of recruiting season over the weekend with a who’s who of verbal commitments and remaining targets, working to solidify what may be its highest-rated recruiting class ever. Among the roughly 20 visiting recruits over the weekend were a handful of key verbal commits: quarterback Manny Wilkins, running back Demario Richard, defensive tackles Connor Humphreys and Tashon Smallwood, wide receiver Tyler Whiley and more. Also spending time on campus were a few top remaining targets: linebacker Ismael Murphy-Richardson, offensive lineman Alex Anderson, junior-college receiver Eric Lauderdale and junior-college cornerback Kweishi Brown. 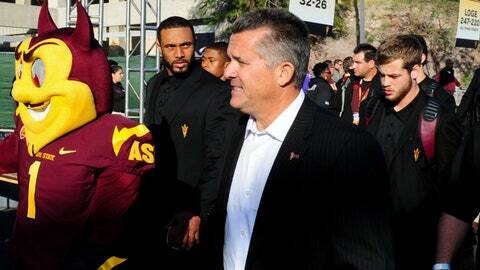 ASU coach Todd Graham and his recruiting staff undoubtedly rolled out the red carpet for the entire group and gave their best pitch to be part of what Graham is building in Tempe. According to recruiting services, the pitch yielded a few immediate results. Scout and Rivals reported Sunday night that Murphy-Richardson, a three-star prospect out of Goodyear Desert Edge, had committed to ASU, giving the Sun Devils a much-needed prospect at the "Devil" linebacker position following Carl Bradford’s decision to enter the NFL Draft early. Murphy-Richardson is touted as a physically gifted player but one still in need of development who appears likely to redshirt in 2014. In less decisive developments, Brown has reportedly made his decision — between ASU and Nebraska — but won’t reveal it until National Signing Day on Feb. 5. Similarily, Lauderdale, a four-star recruit out of Saddleback College in Mission Viejo, Calif., has reportedly narrowed his options to ASU and Florida. On the other end of the spectrum, ASU lost a verbal commitment when three-star offensive lineman Kammy Delp of Pomona (Calif.) Diamond Ranch tweeted that he had decommitted from ASU to reevaluate his options between ASU, UCLA and Washington. The specifics of remaining targets’ pending decisions, however, distract from what ASU has already accomplished in recruiting. With six four-star recruits and 19 three-star recruits verbally committed, ASU currently ranks 11th in Scout’s national team rankings and first among Pac-12 teams. Such rankings are unprecedented for the Sun Devils this late in the recruiting season, though they could change before signing day as other schools, especially in the Pac-12, complete their classes. Regardless, ASU is in uncharted territory, and things should only get more interesting as Signing Day approaches. A strong recruiting class this year is crucial to Graham’s long-term plans at ASU. However, it might not have as much immediate impact as such a highly ranked group might suggest. A handful of the players ASU expects to add this year have a good shot at contributing right away, especially with so many holes to fill on defense. Humphreys and Smallwood, in particular, could compete to start. Whiley could have an immediate impact, as could linebacker D.J. Calhoun and defensive end Renell Wren. More than immediate impact players, though, ASU is bringing in building blocks. Wilkins and/or Vista Murrieta (Calif.) prospect Coltin Gerhart would give ASU quarterback options once Taylor Kelly graduates. Richard and Lackawanna College prospect DeChavon Hayes would leave ASU loaded at running back, even after the departure of senior Marion Grice. And a horde of defensive prospects would give Graham the pieces he needs to keep building the defensive powerhouse he says he wants. As last year’s Signing Day loss of quarterback commit Joshua Dobbs showed, nothing is certain until recruits sign and send in their letters of intent. But as things stand now, ASU looks poised for an impressive haul come Feb. 5.